Several GPS solutions have been produced so far by the ULR analysis centre consortium as new analyses strategies were devised (models, parameterization,...). The latest solution is called ULR5. Its vertical velocity field is submitted in Global and Planetary Change. It is expressed in ITRF2008 using 16 years of GPS data. 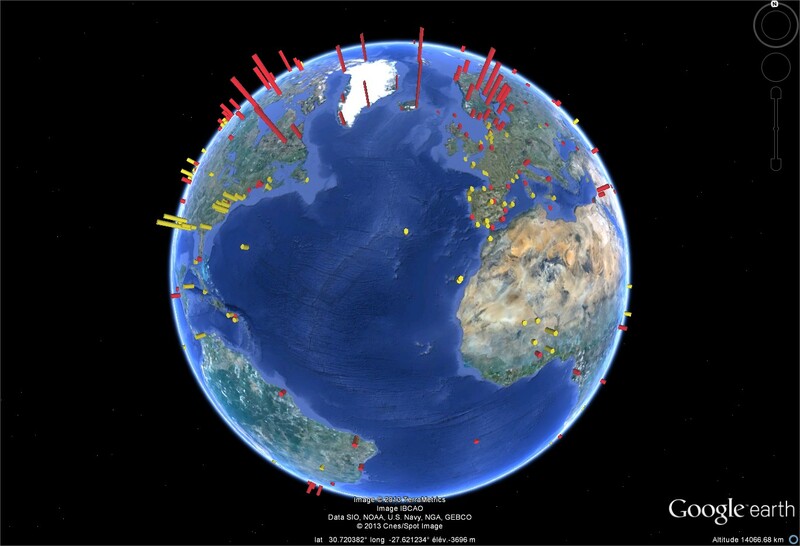 Double-differenced ionosphere-free GPS carrier phase observations from a global network of 420 stations were reanalyzed using GAMIT/GLOBK software version 10.4. The data set covered the period January 1995 to December 2010 and 282 stations out of 420 were co-located with a tide gauge. Station coordinates, satellite orbits, Earth orientation parameters (EOPs), and zenith tropospheric delay parameters every hour, were estimated. Details on the GPS data processing strategy (models, corrections,...) can be found in the IGS-like ULR analysis centre form associated with this solution. The GPS velocities were obtained in the final step of the analysis which combined the weekly GAMIT/GLOBK global network solutions (station coordinates with full co-variances) from the entire data time span into a long-term solution using CATREF software. This long-term solution (ULR5) was aligned to ITRF2008 using minimal constraints over a selected set of IGS Reference Frame stations. Santamaría-Gómez A., Gravelle M., Collilieux X., Guichard M., Martín Míguez B., Tiphaneau P., Wöppelmann G., (2012). 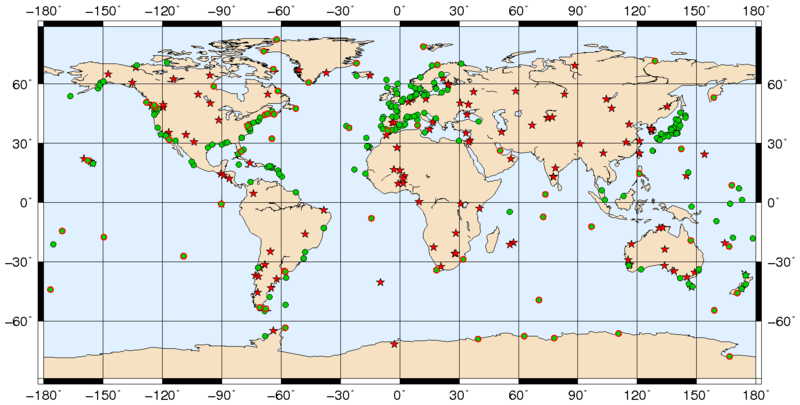 Mitigating the effects of vertical land motion in long tide gauge records using a state-of-the-art GPS velocity field, Global and Planetary Change, Vol. 98-99, pp. 6-17. To assign more realistic uncertainties on the GPS velocities, the noise content in the position time series was examined by the maximum likelihood estimation (MLE) technique using CATS software. Time series were detrended and deseasoned (annual cycles) at the CATREF stage. Details on the GPS velocity uncertainty assessment will be given in the above-mentioned paper. The ULR5_Vertical-Velocities_Table provides the vertical GPS velocities and uncertainties for the 326 stations fulfilling the criterias of 3 years of minimum length without discontinuities and with data gaps not exceeding 30%. 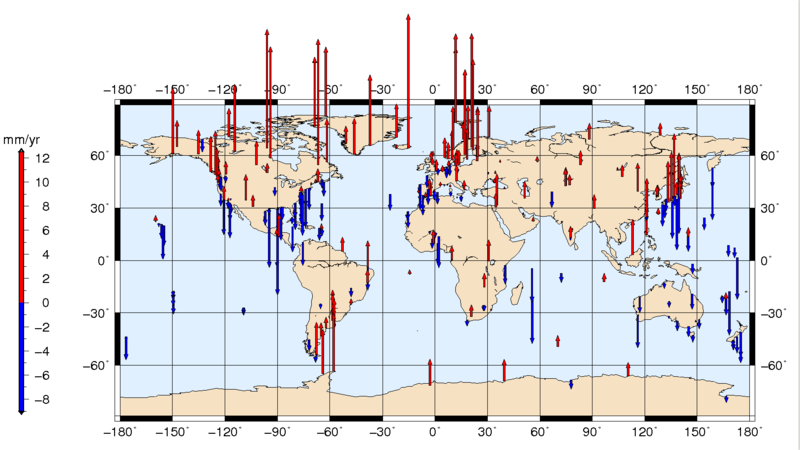 The ULR5_detrend.zip file contains individual station data files of weekly residual position time series in ITRF2008 with respect to the linear long-term combined solution at the reference epoch. These residuals (detrended and deseasoned) are expressed in meters in the local frame (North, East, and Up). The reference position and the 3D velocity in the local coordinate system (East, North, Up) are provided in the header of each file. The ULR5_discontinuities_Table.txt file provides the offsets that were estimated. The ulr5.kmz file shows a Google Earth presentation of the above weekly data files by cliking on a station symbol. The associated IGS-like sitelog can be accessed too, as well as a plot of the residual position time series in the vertical. The long-term solution ULR5 in SINEX format (250 Mo) can be downloaded too. However, we recommend its use only to those familiar with SINEX files, and having a good geodetic background and experience. The ULR5_Vertcal_Velocites.kmz file shows a Google Earth presentation of the ULR5 vertical velocities. For each GPS station a vertical cylinder whose height is proportionnal to the estimated velocity is drawn (yellow for subsidence, red for uplift).